Hickory Nut Falls, also known as Hickorynut Falls, is a waterfall located at Chimney Rock State Park in Rutherford County, North Carolina.The 404-ft. tall Hickory Nut Falls at Chimney Rock State Park is one of the highest waterfalls east of the Mississippi. Take a beautiful woodland hike on an easy 3/4-mile trail to enjoy an up-close view at its base from a platform. While there is no swimming or wading in the cool water, there's a picnic table to enjoy a snack or meal with a view.Hickory Nut Falls flows on Fall Creek through the Hickory Nut Gorge, and is part of Chimney Rock Park, a park that was privately owned until May 2007, when the State of North Carolina completed the purchase of the park.Chimney Rock Park and the Hickory Nut Gorge are being developed into a state park. From Asheville, take I-240 East to US 74-A. 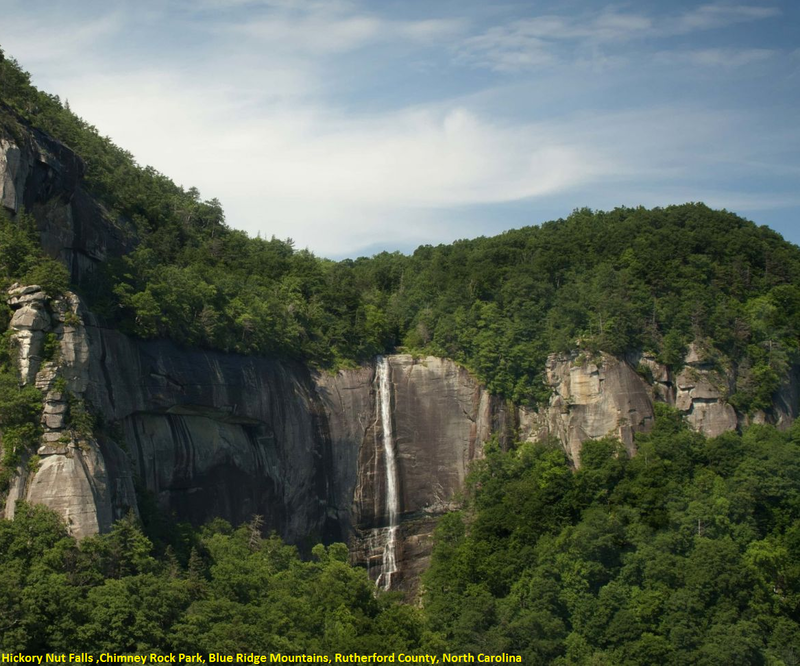 Follow US 74-A to the Chimney Rock Park entrance gate and pay the entrance fee (more information about the entrance fee). Park in either of the top parking lots - the well-signed trail starts at the lower of the two. Trail is best used from February until November.